As the Paramount Fine Foods empire continues to expand, a new location has opened on Yonge, just north of Eglinton. Similar to the other restaurants, their dining room is spacious (occupying two floors) and food arrives efficiently for a simple and quick dining experience. In celebration of Canada’s 150th birthday (coincidently, Paramount is also celebrating their 10-year anniversary), the chain has created the shawarma poutine. 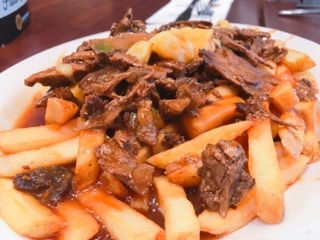 The dish incorporates the traditional ingredients – fries, cheese curds, and gravy (Montrealers, I know it should be poutine sauce) – while adding their signature touch by offering a choice of beef or chicken shawarma on top. Indeed, the beef adds a different flair to the dish, the earthy cumin rub on the meat generating a Mediterranean taste to the poutine. It’s a large portion and can definitely work as a main, but best shared in the Canadian spirit. 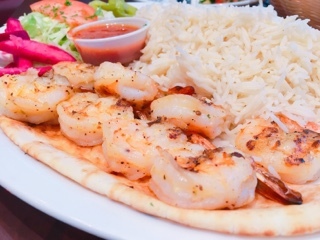 For Paramount newbies, the mezza plate ($8.99) is best to have on hand to dip their freshly baked pita bread into. 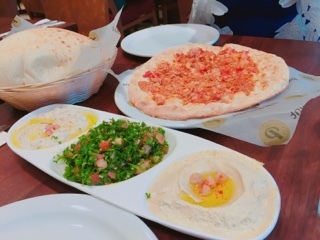 Although the hot from the oven pita can be eaten on its own, the dough itself is rather tasteless; hence, a dunk in the hummus, moutabbal, or tabbouleh is key. Having had it at numerous locations, franchisees don’t seem to follow a standard recipe. Although the main ingredients are the same, the taste changes ever so slightly. 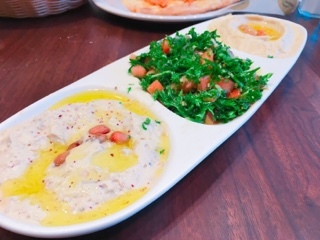 At Paramount Eglinton, their moutabbal isn’t as salty making the grilled eggplant flavour a bit more pronounced; the tabbouleh is as fresh as ever. 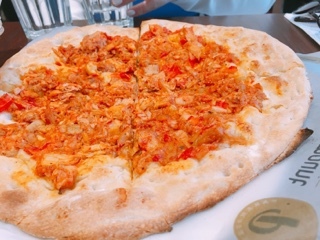 Since it was my first time trying a manakeesh, an eastern Mediterranean topped flatbread, it seemed like a good idea to get the spicy chicken ($5.99) without cheese. Turns out you really need the cheese as after indulging in pizza for decades, eating something that looks like pizza without the cheese feels weird. Moreover, the “spiciness” was less about heat and really had to do with the flavour, instead of a chili spice the manakeesh seemed to have a deep almost bitter essence (although, to be fair, I have sensitive taste buds). Luckily, after adding tabbouleh to the flatbread, the parsley mellowed out the bitterness and it became tastier. Moreover, the manakeesh was unexpectedly large for the low price. The barbeque shrimp plate ($14.99) is quickly becoming my favourite main at Paramount with two skewers of marinated shrimp that always arrive just cooked through and flavourful, especially with the accompanying tomato garlic sauce. Even without the poutine, I find it’s best to pair the shrimp with rice (as opposed to fries) as the grains goes nicely with the tomato sauce or any of the remaining mezza plate. Likewise, the crunchy pickles and turnips are great for easing the stomach after a filling meal. Paramount Fine Foods has come a long way in its 10 years’ operating. What started as a restaurant in Mississauga is now a fast growing chain with locations in Canada, USA, UK, and Lebanon. Mohamad Fakih, founder of the franchise, is certainly living the Canadian dream. Isn’t it perfect that on the chain and the country’s key anniversaries, they celebrate together with the Paramount poutine?